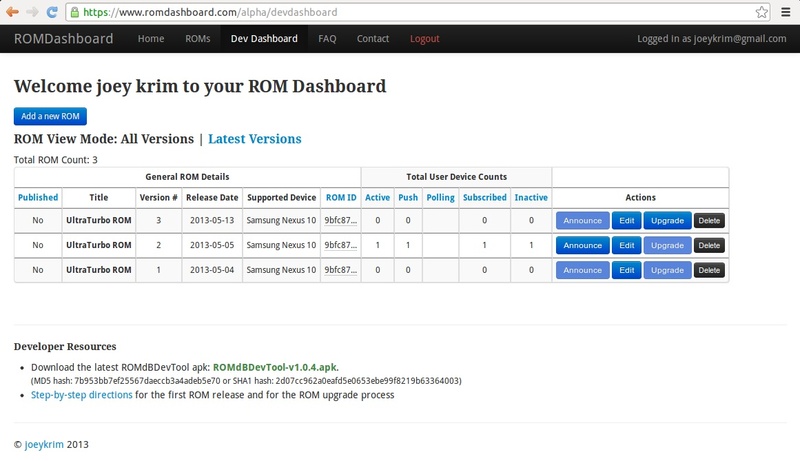 ROMDashboard provides a fast and secure method for developers to communicate with ROM users. This web site and the companion Android application, ROMdB Dev Console serve as simple, quick and secure user interfaces to manage and interact with users of a developer's ROM. The Android application, ROMdB Dev Tool, that easily and securely provides the developer's and ROM's specific information to the user. ROMDashboard aims to make the setup and installation process as simple and convenient as possible. From the Dev Dashboard, press the button labeled, Add a new ROM. Fill out four simple pieces of information (Title, Release Date, Supported Device and Welcome Message), then press the Add ROM button. Take the provided ROM ID hash and the ROM version key/values and add them to the end of the ROM /system/build.prop file. Drop the ROMdBDevTool.apk file into the /system/app directory of the ROM. *Note: If the apk file is instead placed in /data/app/, the results will be unreliable, due to Android blocking the android.intent.action.BOOT_COMPLETED intent for non-system applications. In the Dev Dashboard actions section use the upgrade button to easily create an updated version of the ROM. 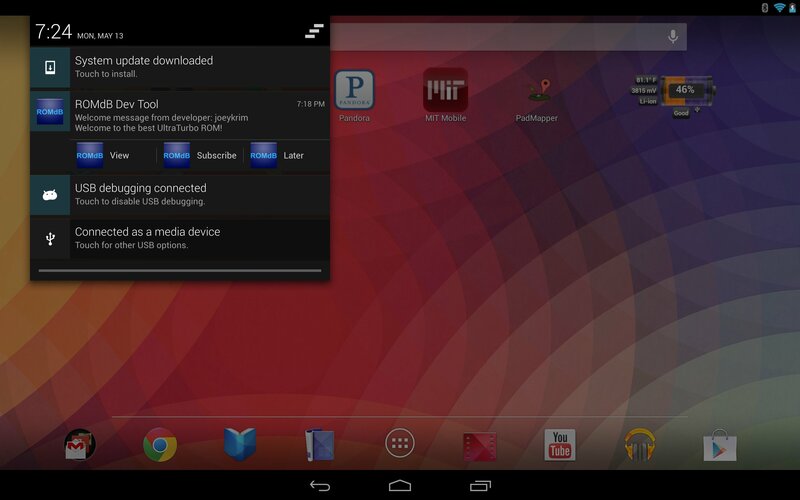 Add the new download mirror links and update the ROM details. When saving the upgrade ROM details, ROMDashboard will automatically announce the upgrade to all users of the previous version! The Android application, ROMdB Dev Tool, aims to make the communication process as secure and simple as possible. After the 1st boot, once an internet connection has been established, a welcome message from the developer is displayed. The user is able to quickly, easily and securely subscribe/unsubscribe to future developer announcements. Users always receive ROM upgrade notifications, which include the updated ROM details and up to four download mirror links. Easily allow the user to download the ROM update, plus confirm the downloaded ROM hash matches. All the developer provided contact information (twitter link, forum profile links, personal web site link, etc.) is displayed front and center to the user. Specific current ROM information is provided to the user, such as ROM title, version, release date, forum links, etc. Easily accessible history of the last 10 developer announcements for the user to review. For the most efficient use of battery life and bandwidth, all push notifications use Google Cloud Messaging. Android versions 2.2 and newer are supported. To use the battery efficient Google Cloud Messaging (GCM) notifications, Google Play must be installed. If Google Play is not installed, a fallback method of interval polling will automatically be used. : Store the ROM Hash that is also used as part of the ROM identity. : Store the version of the ROM that is also used as part of the ROM identity. : On the initial boot, subscribe users to the ROM specific developer announcements. : Prevent ROMdBDevTool.apk from reading, salting+SHA-512 hashing, encrypting, sending, and storing the salt+SHA-512 hash of the IMEI/ESN or WiFi MAC address on ROMDashboard.com. To disable any of the optional build.prop keys, prefix the key with a "#". Notification expanded: Welcome message from the developer received after first boot. Dialog: Welcome message from the notification with a prompt to subscribe to future developer announcements about the ROM. Notification expanded: Announcement message received from the developer for users of this specific ROM. Notification expanded: Upgrade notification received from the developer for users of this specific ROM version. Due to the demand for reliable servers and time requirements for development, there are costs associated with ROMdB. The current pricing structure is designed to cover the costs and make the product available to as many ROM developers as possible. All refund requests will need to be directed to ROMdB. Please use the contact form! ROMDashboard takes the privacy of both the user and the developer very seriously. Below is detailed out the information that is transmitted from each Android device and the reason this information is received. This serves as the unique identifier for each device allowing the developer to understand how many unique users are running a specific ROM. The information can not be reversed back and linked to an individual user due to the irreversible one-way nature of a salted SHA-512 hash. *Note: If the flag ro.romdb.paranoid=y is added at the end of the build.prop file, the salted hash of the IMEI/WiFi MAC will NOT be used (meaning NOT read, sent via encryption, or stored). Ensures the developer specified Android Device type matches for a specific ROM. Via 2048-bit SSL encryption between the Android device and the ROMDashboard server.